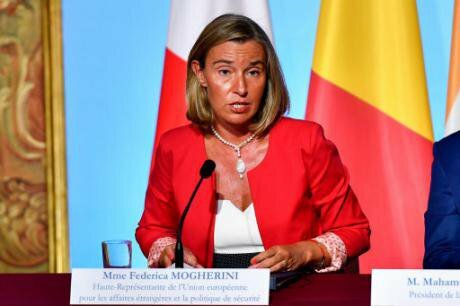 European Union foreign policy chief Federica Mogherini. PAimages/Chen Yichen/Xinhua News Agency. All rights reserved. From hybrid peace to human security: rethinking EU strategy toward conflict: the Berlin report of the Human Security Study Group presented to High Representative of the Union for Foreign Affairs & Security Policy Federica Mogherini ( 24 February, 2016). This report proposed that the European Union adopts a second generation human security approach to conflicts, as an alternative to Geo-Politics or the War on Terror. Second generation human security takes forward the principles of human security and adapts them to 21st century realities. The report argues that the EU is a new type of 21st century political institution in contrast to 20th century nation-states. Twentieth-century nation states were based on a clear distinction between inside and outside. Typical outside instruments were state-to-state diplomacy or economic and military coercion. Typical inside instruments are the rule of law, politics, and policing. In today’s complex, contested and connected world, outside instruments do not work; they backfire and make things worse. Human security is about extending the inside beyond the EU. Hybrid Peace is what happens when 20th century peace-making is applied in contemporary conflicts. Contemporary conflicts have to be understood not as Clausewitzean contests of will between two sides with legitimate goals but as a sort of predatory social condition in which networks of armed groups instrumentalise extremist identities and enrich themselves through violence. Up to now, the EU has focused on top-down peace-making, humanitarian assistance and post-conflict reconstruction. These policies can easily be subverted because they can end up entrenching criminalised extremist networks. Second generation human security is about establishing legitimate political authority and legitimate livelihoods to counter this predatory social condition. It encompasses multi-layer, incremental and inclusive peace processes with particular emphasis on support for local ceasefires and civil society; security assistance in establishing safe areas and safe corridors and protecting individuals and their communities; economic measures including justice to undercut the illegal economy. Second generation human security involves continuous engagement so as to combine prevention, early warning, crisis response and reconstruction as intertwined activities, and places emphasis on gender so as to oppose the extreme gender relations that are constructed in contemporary wars. Civilian-led missions that include some combination of humanitarian workers, human rights monitors, legal experts, police and where needed military forces, and that involve both men and women. On June 20, 2017, this panel discussion launched the new book by Christine Chinkin and Mary Kaldor – International Law and New Wars – which examines how international law fails to address the contemporary experience of what are known as 'new wars' - instances of armed conflict and violence in places such as Syria, Ukraine, Libya, Mali, the Democratic Republic of Congo and South Sudan. International law, largely constructed in the nineteenth and twentieth centuries, rests to a great extent on the outmoded concept of war drawn from European experience - inter-state clashes involving battles between regular and identifiable armed forces. The book shows how different approaches are associated with different interpretations of international law, and, in some cases, this has dangerously weakened the legal restraints on war established after 1945. It puts forward a practical case for what it defines as second generation human security and the implications this carries for international law.